Do You Get the MPG You Expect? I didn’t want to do it, I really didn’t. My idea was to let a week go past without mentioning the price of petrol but I can’t. It seems that every day that goes by we hear more bad news about the cost of filling up your car’s tank. This time prices aren’t going up but it seems as though we have been lied to about the number of miles to the gallon (and therefore pound) our cars do, which is probably even worse. The research has been done by the people at What Car? Magazine and they say that under normal driving conditions, the official figures can be out by as much as 26 miles per gallon. They tested 60 vehicles and, incredibly, every single one of them gave less miles per gallon than the manufacturer states. The magazine now has started up its own initiative for motorists to find out their own real MPG figures. Chas Hallett is the editor in chief of Which Car? and he said that with the price of petrol going up all the time it is an important issue but that drivers are “frustrated” that their own experiences don’t tie in with the figures they have been given. 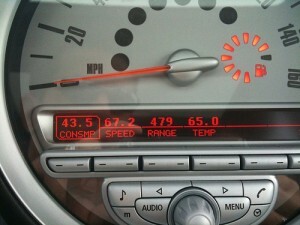 The magazine’s idea to find out the “true MPG” will let people decide the kind of car which suits them more accurately. Among the biggest differences were that of the Ford Focus 1.6 TDCi estate, which did 42 mpg instead of the stated 67 mpg. The Kia Picanto 1.0 was even worse, giving just 41 mpg in the tests compared to the official figure of 67 mpg. The testing was carried out in conjunction with Tesco and used engineers to travel on different types of roads such as motorways, A roads, B roads and town and village roads. The figures also take into account factors such as the weather and driving style. This entry was posted in News and Views, Reports and Surveys and tagged car, Chas Hallett, ford, ford focus, kia, Kia Picanto, LS, MoT, motorists, MPG, price, true mpg, what car? by Robert Bell. Bookmark the permalink.